2017 ¡QUE VIVAN LA REINA Y SUS PRINCESAS! Mariana is 17 years old and will be a 2018 Taos High School graduate. She is an honor student, where she is engaged in advance placement classes and is a member of the Honor Society. Mariana is a very active member in Health Occupation Students of America. She qualified to compete in both Forensics and Community Awareness at Nationals and will be competing in Community Awareness in Orlando, Florida. She is also involved in the Chem Club, helping elementary students with science fairs. She was a member of the Lady Tigers volleyball team and a lively violinist of Mariachi El Tigre. Mariana loves to sing and play the violin, and enjoys drawing in her free time. She is also an active member of the Outlaws 4H Club, competing in crafts like crocheting, braiding and various shooting sports such as hunting and archery. Mariana plans to pursue a career in forensic pathology, and will be exploring her college options this summer. She is the daughter of Jenice Gonzales-Gallegos and Celedon Gallegos of El Prado, and Genaro Jimenez and Jennifer DeBow of Talpa. Her maternal grandparents are MaryAnn Martinez and Johnny Gonzales. Her paternal grandparents are Maria and Alex Gallegos, Isabel Aguilar and Daniel Jimenez. Ariana is audacious and lives life to the fullest. She enjoys reading, being outdoors, raising livestock, hunting, camping, archery and spending time with her family. 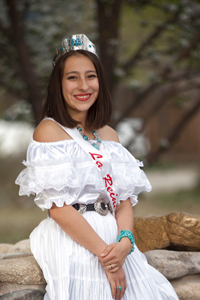 She loves to dance and has been actively involved in the Taos Classics Drill Team. Ariana is also very involved in the St. Michaels Youth Core Groups and the Retreat Team at Our Lady of Guadalupe Church. She is a member of the Guadalupanas Pilgrimage Group. Her plans are to attend New Mexico State University in Las Cruses to pursue a career in medicine with the goal of becoming an anesthesiologist. She has already begun an internship with Taos County EMS. She is the daughter of Juanita and Raymond Baca Jr. of Ranchos de Taos. Her maternal grandparents are Clorinda Georgina Mondragon and the late Pacomio Mondragon. Her paternal grandparents are Doris and Raymond Baca Sr. Her plans are to attend Arizona State University to pursue a career in nursing. Gabriella’s goals are to become a pediatric nurse. She is the daughter of Cyndee Perez and Anthony Perez of Taos. Her maternal grandparents are the late Rafelita Martinez and the late Cipriano Martinez. Her paternal grandparents is the late Virginia Perez and the late Tony Perez.